It appears we've gone from winter directly into summer with hardly a breath of spring in between. On this overly warm Memorial Day weekend, I thought I'd share some of Childe Hassams' luxurious impressionist flag paintings in memory of those who served their country in the past and those who continue to serve today. We owe them much. 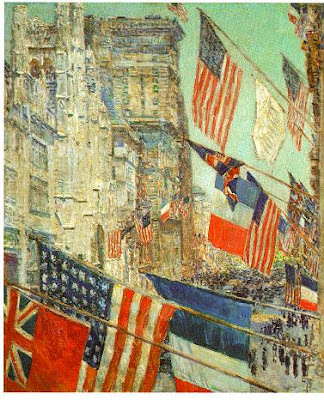 To read about the artist, Frederick Childe Hassam, please go here. Those pictures are quite beautiful and perfect for the weekend. I must try to pay respect this weekend over and through the busy-ness of my life. Thanks for the reminder. Aren't they wonderful? 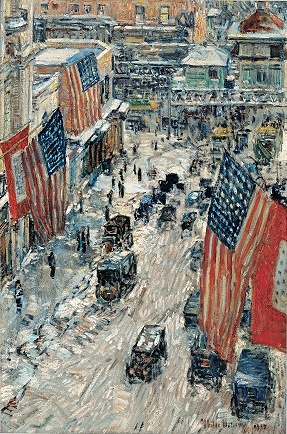 Childe Hassam is one of my favorite painters. Stunning. I love the impressionist painters. What a fine way of celebrating Memorial Day. Spring? It seems we have reached the rainy season, but to be honest our farming neighbours do need all the water they can get. Besides, I have several exams to prepare so it is probably just as well there is no busy old sun to tempt me outside. Jacqueline: I love both the French and the American expressionists. I never get tired of looking at their work. Beautiful Hassam paintings..and I know I've seen at least one in person at a museum recently. Your grand daughter deserves another birthday party .. turning one is a big deal :) Have awonderful time! Thanks, Pat. We're going to have a wonderful time even if the weather doesn't cooperate. But I'm keeping my fingers crossed. Would it dare rain on my granddaughter's parade? Yvette, Happy Birthday to your dear granddaughter, and thanks for sharing Frederick Childe Hassam's lovely and stirring paintings. As the daughter of World War 2 veterans, I was very moved; excellent choice for Memorial Day Weekend! Hi, Dorian. Glad you enjoyed seeing Hassam's work. He's oneof my favorite artists. My dad was a WWII veteran also. He passed away a few years ago at the age of 89 and was buried at a veteran's cemetery. They did a beautiful service. Handed my mom the folded up flag. These old men and women, dying out at a fast rate now. They did so much for us. I wish schools taught history in a way that ingrigued kids more. So that kids today could learn how much we owe these men and women. Love them and what a great reminder of what this weekend is about, not this "let's go to the lake and get drunk" crap. Thank you for the post and the reminder. Perfect post for the weekend. 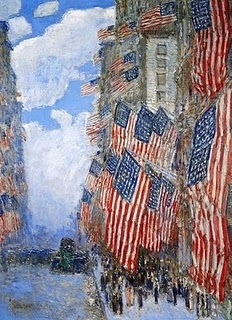 I love Childe Hassam, too, and love his flag paintings. I agree that history could and should be taught in a much more engaging way. I'll admit that often when I read history, my eyes glaze over as I get lost in the dates and the military strategy and the host of characters. I've finished reading two of the Nella Last books of journal entries for World War 11. That's the sort of history I enjoy reading. Personal accounts of what life was really like, told by someone who was there and lived through it. Fascinating, emotional, and educational. Ryan, you're welcome. History was always one of my favorite subjects in school. But the way it's 'taught' today...I don't think kids are getting 'it'. The key word in Memorial Day is 'memorial'. Joan: I often wonder why the fascinating stuff of history that we read about in our own books and watch in documentaries, isn't shared with school children on a regular basis. How hard could it be? Yes, I agree, Patti. 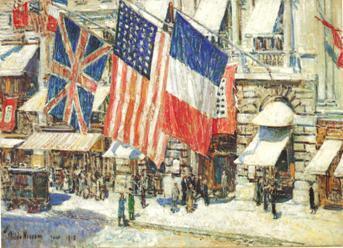 I love Hassam's work.